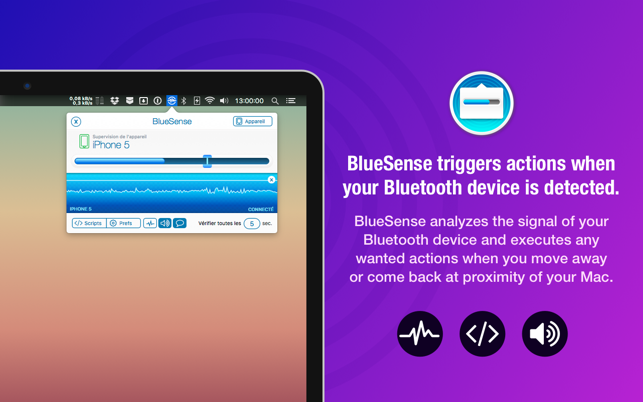 BlueSense analyzes the signal of your Bluetooth device and executes any desired actions when you move away or come back into proximity of your Mac. 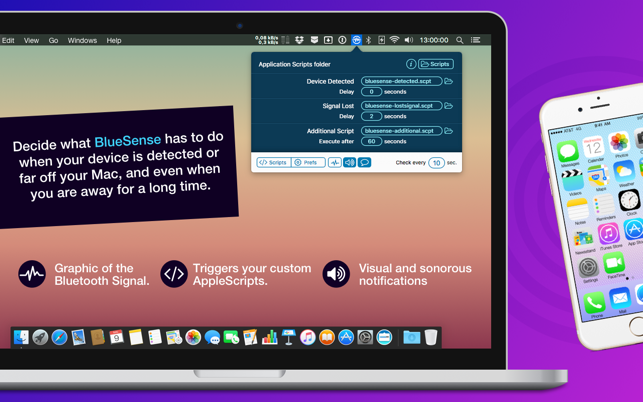 Decide what BlueSense has to do when your device is detected or when you are far from your Mac, and even when you are away for a long time. BlueSense triggers custom scripts when your Bluetooth device is detected, far-away or not detected for a long period. • Friendly interface for retina display. • Remains discreet in your menu bar. • Checks to avoid false positive. • Adjust the verification interval. • Fast check mode when the device is lost, for faster activation when you come back. • Delay the execution of your scripts. • Additional script that runs when the device is lost for a long time. • Nice graphics of the Bluetooth signal. • Adjust precisely the sensitivity of the detection. • Sound alerts and notifications to be notified of the status of the application. • Disable verification sounds, select the system output and volume of the alerts (advanced). • Works with differents Bluetooth devices. • Lock or unlock your Mac to protect him when you are away. • Automatically unlock your Mac by entering the password. • Lock your Mac OS X session when you go outside of your desktop and ensure that it will ask for the password at startup. • Disable the auto login session when you are not in front of your Mac. • Activate the screen saver password and automatically enter the password when you come back. • Automatically change your status (online, away) of messaging application like Skype, Messages. • Play or pause music in players like Spotify, Deezer, iTunes when you quit your screen or come back. 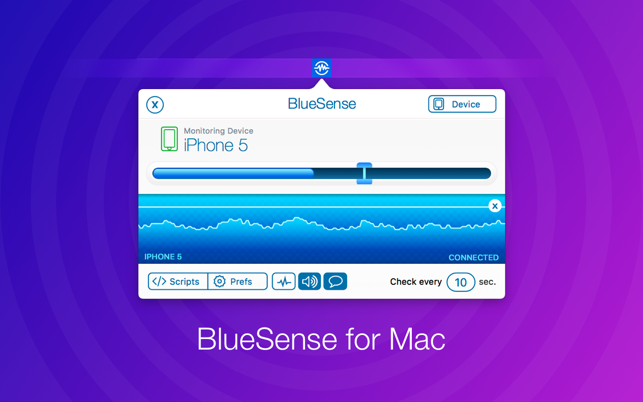 Important: Remember to pair your Bluetooth device with your Mac before using BlueSense. Although good examples of scripts are available on the website, BlueSense requires skills to realize your own AppleScripts scripts. • Fixed an issue for users using a version of macOS prior to 10.12. • Fixed an issue with “Fast search” who could crash the app on some systems when device is “out of range”. • Stability and general improvements. This app needs a lot of babysitting. If you restart your computer, or sometimes it seems just on waking from sleep, you have to manually reconnect it to your phone, or it won't work. Even if your phone is a foot away, it won't find it unless you manually point it at it every time you restart the program. This also means putting your phone into discovery mode for it to work, you can't just tell it to find it again. It's a bit of a pain. I know there's no hardware limitation preventing this, because ControlPlane can automatically hook up to a nearby bluetooth phone after being pointed to it just once, without having to touch the phone at all or put it into discovery mode. In fact, once ControlPlane connects with it in this way, suddenly BlueSense can see it just fine. I tried to find a way to get ControlPlane to automatically open the link periodically, but so far haven't managed to get it to work reliably. But there's no reason BlueSense shouldn't be able to just do that on it's own, without my having to open up another program to get it to happen. Then, sometimes, even after it connects, it starts thinking your phone isn't there, even if it's right next to it. You have to quit the app, and restart it, and re-point it at your phone manually again. This app should just work, without having to pay attention to it to keep it working. Then it would be a great app.